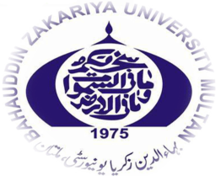 Bahauddin Zakariya University (BZU) (Urdu: جامعۂ بہاؤالدین زکریا‎) is a public university with its main campus in Multan, Pakistan. Bahauddin Zakariya University was founded in 1975 as Multan University, and is one of the largest universities in Punjab. It was renamed in honor of a Sufi saint Hazrat Baha-ud-din Zakariya (1171-1262). As a degree awarding government university, it offers degree courses in more than 60 majors, including pharmacy, engineering, humanities, business administration, law, art, music, IT, agriculture and languages. According to newly published 2016-2017,Times Higher Education (THE) Ranking System, Bahauddin Zakariya University is ranked within Top 800 most powerful universities worldwide. In 2014, The university was also ranked 8th nationally by General Universities Category of Higher Education Commission of Pakistan (HEC). The university started functioning in 1975 in rented buildings with eight departments. Now the university has a large campus with sixty departments and several constituent colleges, such as University Gilani Law College and Multan College of Arts, and faculties including Veterinary, Agricultural Science and Technology (FAST) (formerly University College of Agriculture or UCA), Engineering and Technology. The university also has residential facilities for students and staff. The Bahauddin Zakariya University is a general university, providing education in Arts and Science. Since agriculture is the mainstay of this region (the place and its environs produce the country’s best silver crop (cotton) and fruit crops like mangoes, citrus, and dates), it was considered expedient to train manpower for solving agriculture problems. Accordingly, a College of Agriculture was established in 1989. The College of Agriculture and its complement, an Engineering College, form an integral part of the University Plan. The College of Engineering & Technology was established in 1994. Department of Commerce was started in November 1996. BBA classes were started in the Department of Business Administration in October 1996. Bachelor of Computer Science was introduced in the Department of Computer Science in November 1996, though Masters in Computer Science (MCS) was already running since 1989. B.Sc. Electrical Engineering class was started in November 1997. Information Technology Centre was established in July 1999. BS and MSc. Telecommunication System was started in January 2004. B.Sc. Mechanical, Computer, Textile, Agricultural and Architectural Engineering classes were started in fall 2004. All degrees awarded by the university are recognized by HEC and PEC. The university is at 10 km from the city centre. The main campus is spread over 12 acres. Its back gate is golden present which is 6 km from chowk kmharanwala. The main objective of Bahauddin Zakariya University is to provide facilities of higher education and research to the population of the southern region of the Punjab, covering the Civil Administrative Divisions of Multan and Dera Ghazi Khan. The university fulfills the triple function of teaching, affiliation and an examining body, and has 79 affiliated colleges which include such old and prestigious institutions as the Government Emerson College Multan, Government Post Graduate College (Sahiwal) and Government College, Burewala. Formerly it was called UCA means "University College of Agriculture" and now it is called FAST (Faculty of Agricultural Sciences and Technology). FAST provides 8 Major subjects for specialization after 2 year but for evening program only four. To improve the academic facilities of remote areas former governor of Punjab Lt General (Rtd) Khalid Maqbool opened sub-campuses of public sector universities with a vision to transform them into independent universities in future. Up till now following sub-campuses of Bahauddin Zakariya University have been opened. Following are the hostels accommodating students. Advertisements are placed in the prominent newspapers. The shortlisted candidates are invited for interview by selection board.